"Google officially launched 'Wallet', the first pay by phone service"
Google Wallet is an Android app that makes your phone your wallet. It stores virtual versions of your existing plastic cards on your phone. Simply tap your phone to pay and redeem offers using near field communication, or NFC. Ahead of other companies, Google Wallet launched first on the Samsung Nexus S on the Sprint Nextel network. Also partnered in the initial scheme are Citibank and MasterCard. As other Android phones are fitted with the NFC (near field communication) technology, more like services will appear on the market. Google also said today that it has licensed NFC technology from other major credit card companies: American Express, Visa, and Discover. 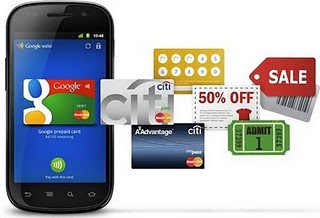 This means that upcoming versions of Google Wallet will support those credit cards as well. "In the future, our goal is to make it possible for you to add all of your payment cards to Google Wallet, so you can say goodbye to even the biggest traditional wallets," said Osama Bedier, vice president of payments at Google.